The new studio offering from Kim Gordon and Bill Nace offers an experience that's less tied to the raw emotions of the past and more focused on the exacting, brilliant technical and compositional skills of its creators. Upon its release, it was clear that Body/Head's album Coming Apart was a viscerally personal piece of work. The more sensationally-minded among us (myself included) drew the obvious conclusion between the album's raw emotional core and Kim Gordon's then-recent explanation behind her separation with Thurston. While Gordon has seemed eager to move on from that chapter of her life, it doesn't detract from Coming Apart's brilliance one bit. Yet that connection can be hard to sever, and The Switch, Gordon's latest collaboration with guitarist Bill Nace as Body/Head, appears to be a reaction to the album that came before it. In the process, it provides an avenue for the duo to explore on future releases, one free from any narratives or baggage from the past. 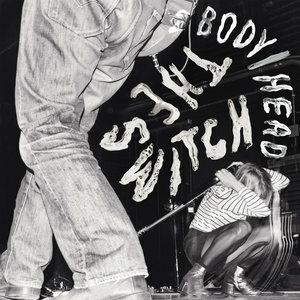 The image that graces the cover of The Switch is one of the sorts of organized chaos that takes place at Body/Head's live performances: Nace's legs facing away from us in the foreground framing a crouching Gordon playing a guitar slung over on her back. It acts further as a metaphor for what's contained within; The Switch is first and foremost an instrumental record, far more so than its predecessor. Here, Gordon and Nace act as proper composers, guiding the soundscapes emanating from their guitars with a deceptive precision. Gordon's vocals -- arguably the central feature of Coming Apart -- fade somewhat into the background, only appearing to punctuate the looping feedback and squeals. Instead of grabbing you by the scruff of the neck and demanding your attention, Body/Head encourage a more passive listening experience on The Switch. This is music made to wash over you slowly as it unfolds with each note. What some may miss is the previous album's suggestion of an arc to follow, something that The Switch defiantly lacks. This is a piece of art made for its own sake, a composition made by professionals on equal footing. What appeal that has is up to the listener, but this, in some ways, feels like the truest expression yet of what Gordon and Nace want to do with this project. The band shift from packed noise to sparseness with near-clockwork precision, molding atmospheres deliberately rather than instinctually. On "Change My Brain", each note has a purpose as the duo build upon each guitar phrase as they envelop the listener through squalls and loops. It may appear chaotic, but Gordon and Nace are crafting something startlingly precise and beautiful with each added effect. That, in turn, is the true triumph of The Switch: it provides a compositional roadmap to anarchy. It can be difficult to really give oneself over to an album like The Switch, even as it's what Gordon and Nace clearly expect. Going through the album evokes feelings of being dangerously adrift, lost without anything familiar to cling on to. For those who seek out an aural experience outside one's comfort zone, though, The Switch is fascinating and endlessly rewarding, even if it occasionally bears the marks of art being made for the sake of it. The nerves the band strike aren't as raw as in the past, but these two show an exacting control over their craft that few artists have ever possessed.